We have three retail locations to better serve you: the Medical Center Pharmacy and Mountaineer Pharmacy are full-service pharmacies for patients, students, and the community. We bill most insurance and major pharmacy prescription plans. We offer competitive pricing on medications, and a 10 percent discount for senior citizens, WVU faculty, staff, and students. When you refill your prescriptions, you can enroll in our automated refill program. Eligible prescriptions will be automatically refilled before they run out. We will notify you when your medication is ready or you can have it automatically delivered to you. We also offer a variety of in-stock items, such as over-the-counter medications, personal hygiene, wound care, eye care products, contact lens holders, earplugs, dental care, and foot care items. WVU Medicine pharmacies provide our community with advanced services that are not always commonly available. We take pride in offering our patients the highest level of care and competitive pricing strategies. Sometimes patients need unique custom drug strengths, dosage forms, or a combination of medications that are not available in a pre-manufactured way. In these instances your physician writes a prescription for what you need, and a compounding pharmacy mixes the needed medication. 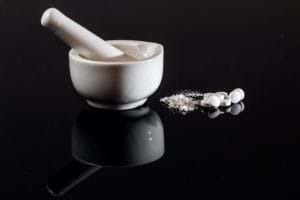 Not all pharmacies are able to offer compounding services. WVU Medicine pharmacies are pleased to be able to offer this unique service. Some over-the-counter medications can interfere with prescribed medications. Our pharmacists are always available for patient consultations to help you determine which nonprescription drugs you can use safely. We train patients to use their blood glucose monitoring equipment properly. Some monitors are easier to use because they have fewer steps to operate. Some machines use less blood or time to get results, but the training will show you how to correctly operate your testing system so you can ensure that you are getting the most accurate readings. We will train you to properly store and check your testing supplies for your monitor. Because test strips and monitor supplies can be expensive, we can help you verify that your insurance company covers the cost of the supplies before purchasing your monitor. Our staff will teach you how to properly clean and maintain your selected unit and how to ensure your glucose monitor’s accuracy. It is important, in addition to monitoring your blood glucose levels, that you maintain a written log of blood glucose test results. We will show you how to keep your testing records so you can take them with you to your doctor’s appointments. Contact us to schedule an appointment for your diabetes monitoring equipment training. If you have PEIA insurance and are a diabetic, this program can help improve your health and save you money. In this program, pharmacists work with you to teach you about your condition, train you on the use of your testing meter, track your blood sugar level, and evaluate and track your medications to help you achieve the best level of health. For more information, visit the West Virginia Public Employees Insurance Agency Face To Face Care Management Program website. Medical Center Pharmacy offers automated prescription refills 24 hours a day, seven days a week by calling 304-598-4848 and entering your prescription number or by clicking the prescription link and ordering online. You can pick up orders during regular business hours. Free 15 minute parking is available in front of the canopy of the Physician Office Center. When refilling a prescription over the phone or online, please be sure to have your prescription number ready. Your prescription number is located on the front of the label just above your name. To refill your prescription by phone, call 304-598-4848. To refill your prescription online, click the link below and complete the Refill Request Form. When filling out the refill form, remember that fields with an asterisk are required fields. Under the Patient Information section, enter your first and last name. The last name must be entered exactly as it appears on the prescription label. Under the phone number, please enter a number where you can be reached if the pharmacist has a question. The e-mail address field is optional. If you wish to receive an e-mail confirming that your order was received by the pharmacy, enter your e-mail address. In the prescription boxes, enter the prescription number or numbers that you wish to refill. You may enter up to eight prescriptions. The prescription number is located on your prescription label, the above example shows you where to locate the prescription number on your bottle. All prescriptions entered must match the last name as written on the bottle label. You can choose to pickup your prescription at the pharmacy or have it mailed to your home. You may also choose to have the pharmacy contact your doctor if your prescription needs authorization. When you call to request a refill, the IVR system communicates with our pharmacy to verify the prescription status and determine if refills are available or if it is too soon to refill. The IVR system will tell you when your order will be ready. Mountaineer Pharmacy is conveniently located on the ground level of the Health and Education Building, near WVU Student Health and the WVU Urgent Care, Evansdale location. Download a printable map | Click on the map to enlarge. We offer automated prescription refills 24 hours a day, seven days a week by calling 304-285-7348 and entering your prescription number or by clicking the prescription link and ordering online. You will be able to pick up orders during regular business hours. You can pick up your prescription at the pharmacy or have it mailed to your home. You may also have the pharmacy contact your doctor if your prescription needs authorization.